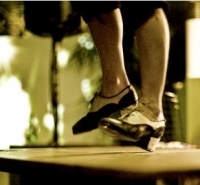 Tap dance, Sydney – beginner adult 6-week course. Have you always swooned at those old Hollywood films and imagined yourself conquering those tap moves? Want to get fit doing something more fun and social than a gym class? Then this is the perfect class for you! I cater to beginner to intermediate levels. If you have done a little bit of tap dance or none at all, this class is for you. Centrally located in Darlinghurst, this course is designed to bring you up to a proficient level within 6 weeks of weekly classes. Conveniently located in the heart of Darlinghurst just a short walk away from Museum station. Busuttil trained in tap dance in Australia and in the USA and has been tap dancing her way around the world ever since. She was a performer with the dance theatre troupe Dorky Park with Constanza Macras. She has performed solo tap performances in Australia, England, The Netherlands as well as in Chicago and New York City in USA. In 2009 she performed with NYC DJ Nik Fit as part of the How Do You Are Festival in Bordeaux, France. Since 2010 Diane performs with drummer/percussionist Tayfun Schulzke at private and corporate parties and festivals in Berlin.